Abstract: Luting materials are a central component of indirect dentistry, with the most recently introduced types being resin-based materials. These may be classified into conventional resin luting materials, self-adhesive resin luting materials and 'smart' resin luting materials. Their physical properties have been found to be good, with no risk of dissolution in the dilute organic acids found in plaque, such as occurs with phosphate and glass ionomer cements. Uses of resin luting materials include the luting of any indirect restoration, but these materials have facilitated the development of the resin-retained bridge and aesthetic ceramic or composite restorations, notwithstanding the fact that they may provide, for the first time, truly adhesive luting of crowns and inlays. Clinical relevance: Resin luting materials are appropriate for placement of all indirect restorations: the self-adhesive variants have simplified the use of such materials. 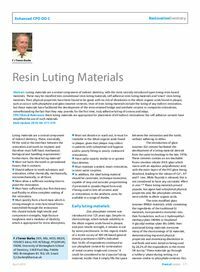 Objective: To describe the properties and clinical uses of resin luting materials.